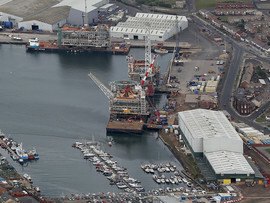 Two purpose-built construction facilities located around the sheltered Victoria Harbour in Hartlepool. This prime North East England location affords ready access by sea, air, road and rail and is nestled between Teesside and Tyneside, two of the industry's major sources of fabrication skills and expertise. The construction site consist of two fabrication halls and cover 76,401m2 with a 355 meter 15,000 tons capacity quayside for large load-outs.